When trying to alter the query in Report Builder 3.0, I get error "Can not connect to database"
="http://servername/ReportServer_REPORTS16/Pages/ReportViewer.aspx?%2fdummy%2fDocuments%2fCertificate+of+Insurance+Issued&rs:Command=Render&PolicyNo=" & Parameters!PolicyNo.Value &"& Entitled="&Parameters!Entitled.Value &"&rs:Format=PDF"
The ActionInfo.Action.Hyperlink expression for the text box ‘Textbox48’ contains an error: [BC30277] Type character '&' does not match declared data type 'Object'. I've gone through every similar error I've found on google but cant work out where im going wrong. Here'a an exmaple from one of my reports that does the same thing. Note: The first line just disables the link if there is now value in a particular column. This does not render to PDF but that's not part of your issue. I'm using a virtual MS SQL Server hosted in Azure and using Report Builder 3. I created the report, and the report runs correctly. I've also gone into the data source and clicked Test Connection and it comes back successful. I added a new field to the view that this report uses, and I want to add that new field to the report. When I refresh the fields I get the following error message. 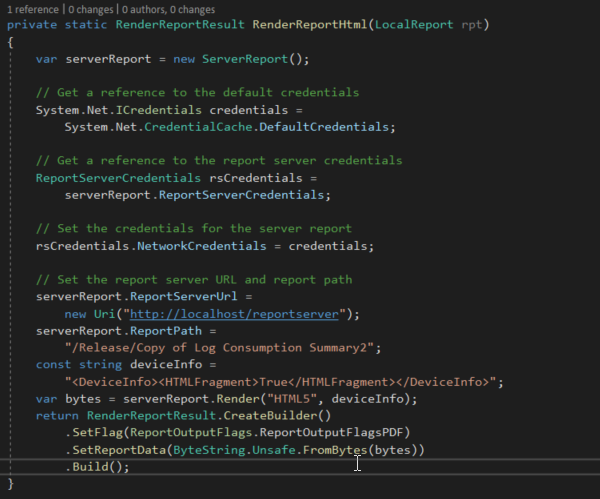 I have some reports with SSRS in a mvc page, I need to print those reports in chrome. I need to show a report weekly for sales of a specific item "Phone1". When I currently run the report, if an employee does not sell that item it omits them from the report. I want to show them even if no sales. I have tried a few options including (IsNull) and (IsNothing). These still do not have the expected outcome. The result should show all employees withing the company even if they do not have a sale for that time frame. Here we have 2 parameters: @Start_Date and @End_Date which are input to user and then I am trying to pass this to Netezza but I am getting issue. I am not sure I am passing parameters to Netezza correctly.